Sens. Terry Gerratana, left, and Beth Bye are among those leaving the Senate for the administration. At least five legislative seats will fall vacant Wednesday as Sens. Tim Larson of East Hartford, Terry Gerratana of New Britain and Beth Bye of West Hartford and Reps. James Albis of East Haven and Chris Soto of New London join the administration of Gov.-elect Ned Lamont. Senate Democrats scrambled Monday night to reshuffle committee co-chairmanships after it became clear to them that Larson and Gerratana would join Bye in the exodus to the executive branch that comes with new administrations. Larson will become the executive director of the Office of Higher Education, Gerratana will be an adviser in Office of Health Strategy, and Albis will be a senior adviser to the commissioner of energy and environmental protection, administration and legislative sources said. It was previously announced that Bye would lead the Office of Early Childhood Education and Soto would become the administration’s director of legislative affairs. Lamont made Larson’s nomination official Monday night, issuing a statement announcing his appointment. Sen. Tim Larson, D-East Hartford. Larson, a former East Hartford mayor and the brother of U.S. Rep. John B. Larson, is currently the executive director of Tweed New Haven Airport. The nominations of Larson and Bye are subject to legislative confirmation. 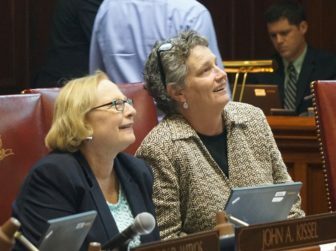 The terms of Lamont, lawmakers and other state officials elected in November begin Wednesday, also the opening day of the 2019 General Assembly session. Miriam E. Delphin-Rittmon, Department of Mental Health and Addiction Services. Scott Jackson, Department of Revenue Services. Jorge Perez, Department of Banking. Amy Porter, Department of Rehabilitative Services. Tom Saadi, Department of Veterans Affairs. Jordan Scheff, Department of Developmental Services. Michelle H. Seagull, Department of Consumer Protection. Vicki Veltri, Office of Health Strategy. Kurt Westby, Department of Labor. Talent searches continue for other agency heads, but some incumbent commissioners still are in the mix and will be evaluated against other candidates. In a few cases, commissioners have been informed that Lamont wants fresh leadership.Those agencies include the Department of Economic and Community Development and the Department of Motor Vehicles. Democrats won majorities of 23-13 in the Senate and 92-59 in the House, though one House race still is being contested. Bye, Gerratana and Larson all hold safe or relatively Democratic seats. While the House majority is only losing two members, there likely will be a ripple effect as some House members consider running for the soon-to-be-vacant Senate seats.